The Heritage Branch has a broad mandate and plays a central role in all aspects of Ta’an Kwäch’än heritage, including language programs, traditional skills and arts, historical research and heritage site management. We take the lead in implementing Chapter 13, Heritage, of the Ta’an Kwäch’än Council Final Agreement and develop heritage policies and procedures. Our main goal is to ensure that Ta’an Kwäch’än culture and heritage is preserved and passed on to future generations. The Yukon First Nations Heritage Group is made up of heritage staff representatives from all 14 Yukon First Nations, including some trans-boundary First Nations. We work on projects of comon concern, such as heritage training programs and a traditional knowledge policy. The Yukon First Nations Heritage Group also serves as a excellent tool for sharing information with the entire Yukon First Nations heritage community. The Heritage Branch contributes to impact assessments in the Ta’an Kwäch’än Council traditional territory to ensure that Ta’an Kwäch’än heritage resources and interestes are protected for future generations. It is our view that heritage resources are not just limited to tangible heritage, such as archaeological sites or old cabins, and, for this reason, we also work to protect traditional use areas, story and sacred sites. Chapter 13, Heritage, of the Ta’an Kwäch’än Council Final Agreement contains clauses about program funding, heritage resource management and specific heritage sites. Implementing these clauses means that the Heritage Branch has to work in partnership with the Government of Canada and the Yukon Government. The Heritage Branch holds weekly, evening language lessons in the Ta’an Kwäch’än Council administration building. The sessions are taught by Georgina Stone, a TKC citizen and Southern Tutchone language instructor at Hidden Valley school, who is also part of a mentor-apprentic language program. 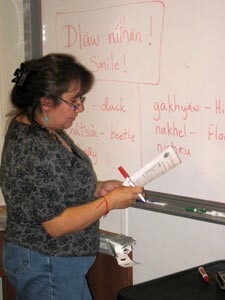 In the past, classes were also taught by Linda Harvey (Kuketlélma) and her mother Irene Smith. The classes are aimed at beginner to intermediate students. Our intent is to teach basic Southern Tutchone language skills with a focus on things like personal greetings, conversational phrases, and the names for feelings, weather, animals and the land. A dedicated group of about twenty people attends these classes regularly. 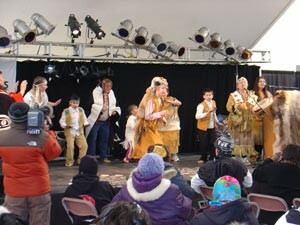 Our dance group welcomes all Ta’an Kwäch’än citizens and families. The dancers perfom and practice regularly and have been quite active over the last few years, with major performances at the Canada Games 2007, the Gathering of Northern Nations 2007, the Juneau Celebration 2008, and the North American Indigenous Games in Cowichan, B.C. in August 2008. Photos from these performances are available in the photo gallery. The Heritage Branch plays a major role in planning and delivering the Ta’an Kwäch’än Council annual culture camp at Helen’s Fish Camp on the western shore of Lake Laberge. A committee with representatives from the Elders Council, the Board, the Youth Council and the departments of the Ta’an Kwäch’än Council develop the programs and activites. The camp is usually held early August of each year. If you have any ideas to offer, get in touch with us. Check out some pictures from past camps in the photo gallery. Starting in 2007, the Heritage Branch has hired several Ta’an Kwäch’än youth each summer to help maintain our cultural sites. The youth are guided by a crew leader and an Elder. In 2007, we cleaned up the campsites and playground at Helen’s Fish Camp and brushed out the Laberge Cemetery. 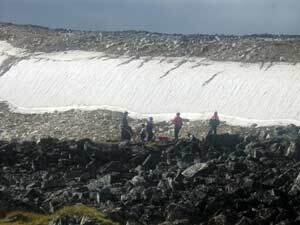 In 2008 we continued this work, and began site maintenance and building stabilization at the Upper Laberge village. 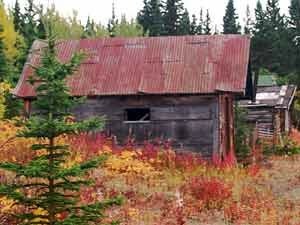 We’re planning to do more extensive restoration work on the buildings at Upper Laberge in the near future. We’re also planning to place protective signage at heritage sites throughout the Ta’an Kwäch’an Traditional Territory in order to ensure that they are respected. We’re also working on interpretive signage for Upper Laberge and Winter Crossing. We invite you to visit Dánän Kwänje – Our Land Speaks, our new website featuring Southern Tutchone place names and the stories and histories of those places. We have been researching Southern Tutchone place names for over 15 years—research that continues today. The Elders wanted this information to be available to all Ta’an Kwäch’än citizens—especially the youth—and asked the Heritage Branch to share this priceless knowledge on a website developed for this purpose. The website features an interactive map, sound files of Elders speaking place names, photos of the places, and background histories and stories about the places. The website is easy to update and improve. If you have any ideas or information to share, call us. We hope to add videos, in the near future, of Elders telling stories and histories. Based on the success of our place names website, we decided to develop a board game based on the site. The Southern Tutchone Language lessons group came up with the design of the game and its features. Players travel along traditional Ta’an Kwach’an trails; as they arrive at different locations they must pronounce the Southern Tutchone name for the place. If they can do so without help, they collect two Danan Kwanje cards (only one card if they need some help). The first player to collect ten Danan Kwanje cards and return to Lake Laberge wins! Copies of the game are available for Ta’an Kwäch’än families through the Ta’an Kwäch’än Council heritage branch. Many of the buildings at the Upper Laberge village are near collapsing. Some already have. The Heritage Branch has been working in partnership with Mr. Glenn Grady (who was born at the village) and restoration expert Garth Stoughton to propose some technical options for stabilzing the buildings. In the fall of 2008, we braced the buildings that were in danger of collapsing over the winter. We plan to continue stabilization and restoration work over the next few years, and to develop interpretive signage for the site. The Ta’an Kwäch’än Council works in partnership with other First Nations and the Yukon Government on research projects related to mountain top ice patches. The patches of snow and ice, in the past, did not completely melt in the summer and attracted caribou trying to get away from insects. The caribou, in turn, attract hunters who would sometimes leave pieces of tools and clothing behind. These artefacts survived preserved in the ice and today can be found as the patches shrink due to the warming climate. The artefacts reveal that First Nations people have been hunting here for almost 9,000 years. The Ta’an Kwäch’än Council, participating in cooperative fieldwork at the ice patch sites, is currently conducting traditional knowledge research with its citizens about ice patch topics. The Ta’an Kwäch’än Council has started hiring Ta’an Kwäch’än citizens on a casual basis to document their family’s genealogy with a particular focus on old, traditional names. The information will be compiled into a computer program and stored in a database at the Ta’an Kwäch’än Council. If you are interested in this line of work, give us a call. Two families have completed this work so far, and we hope to hire people from the other families to do this work soon. The Ta’an Kwäch’än Council has successfully nominated Chief Jim Boss as a National Historic Person. 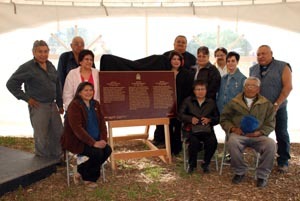 Chief Jim Boss was commemorated with a bronze plaque in the summer of 2008. The Heritage Branch is also in the process of nominating Winter Crossing (T’äw Tà’är—”grayling run up”) as a National Historic Site.